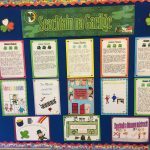 Comhghairdeas do bhuaiteoirí na gcomórtais – Maith sibh! This week we are asking, ‘Where do you live?’ and giving different replies. 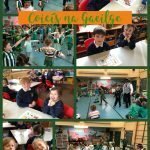 Gach Rang: Cá bhfuil tú i do chónaí ? 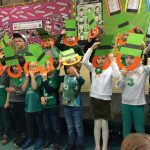 Tá mé i mo chónaí i gCorcaigh. 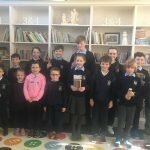 Na Meánranganna : Tá mé i mo chónaí i mBaile an Mhanaigh. This week we are talking about sunshine. 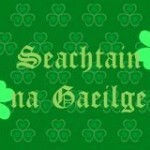 Gach Rang : Tá an ghrian ag taitneamh. Tá sé te. Na Meánranganna : Tá an ghrian ag taitneamh go hard sa spéir. Lá breá brothallach atá ann. This week we are saying ‘Excuse me’ and ‘You’re welcome’. We are also practising common questions that are asked in class. Gach Rang : Gabh mo leithscéal. Tá fáilte romhat. 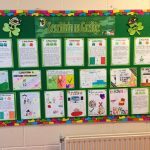 Na Meánranganna : Cén leathanach, a mhúínteoir? Cad is brí le….. ? This week we are asking and answering the question, ‘Are you tired?’. Gach Rang : An bhfuil tuirse ort? Tá tuirse orm. Na Meánranganna : Tá tuirse an domhain orm. Tá mé caite amach.